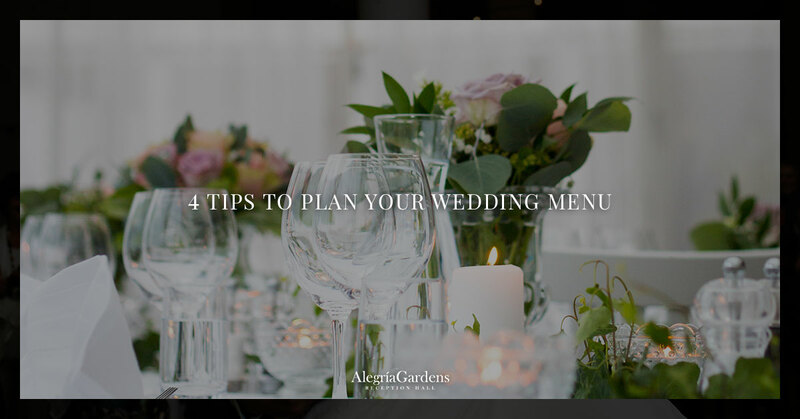 As you embark on wedding planning, you’ll quickly find that some parts of the day are easier to plan than others. You and your fiance might agree totally on getting a DJ versus a live band, and you might already have the hotel block booked. For a lot of couples, though, planning the menu and food service tends to be one of the harder decisions to make. Not only are there personal taste preferences to weight, but there are also seemingly a million dinner service options to choose between. If you’re planning your wedding, keep these tips in mind as you tackle those tricky food decisions. The food at your wedding isn’t just about satisfying taste buds — the food service is also a pivotal aspect of the event’s flow and timeline. For instance, a two-course seated meal (think a small starter like a salad or soup and an entree) takes generally 1.5 hours. This is 1.5 hours of your reception, where you can make room for a welcome, speeches, and a few more pictures. If you add a plated dessert, you’re adding time to the seated portion of the meal. There’s no right or wrong timeline; instead, it’s a matter of what you and your guests prefer. If you have a rowdy group that you know will want to dance, consider a two-course meal with a hefty hors d’oeuvres cocktail hour. Just because it’s your wedding doesn’t mean you should only consider your flavor palette. After all, you might have 10 minutes to eat between greeting great aunts and taking the millionth picture of the day. Use what’s in season as inspiration for a menu rather than your particular favorite food. Choosing in-season ingredients can also make the price-per-head drop a bit. If you’re going for the buffet option, consider having at least one vegetarian or pescatarian option. Just be sure that you’re considering general tastes rather than just your own. If you’re having an outdoor wedding in August, heavy cream-based dishes won’t be your best option. Think instead about lighter arugula salads, lean cuts of meat, and vegetable-heavy options. The same goes for dessert. If you’re offering more than cake, consider choosing a pie or summer-time dessert rather than a heavy custard. If you haven’t already picked your wedding venue, we strongly urge you to consider one that has food vendors and catering as an option. Even if the wedding has a list of vendors with whom you can work, having a limited list makes it much easier to figure out the catering. 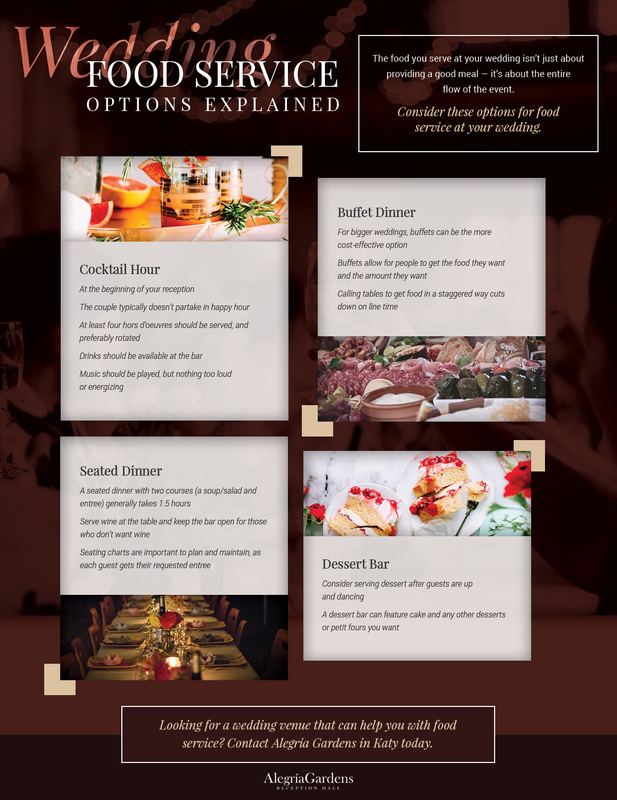 There are numerous benefits when it comes to using a venue-based caterer. For one, the caterer knows the space almost as well as their own kitchen. This makes timing and service much more effective. Alegria Gardens is the Top Rated Local® wedding venue in Katy. We have two locations and staff, wedding planners, and vendors to choose between. Contact us today to inquire about availability or set up a tour of our wedding venue in Katy!